As part of the nursery mission of creating responsible, productive students by increasing their community involvement efforts and as we believe that this starts from a very young age, we are proud of our recycling program. We invite our parents and children to participate in a recycling project in coordination with “Keep It Clean”. Recycling turns materials that would otherwise become waste into valuable resources. In addition, it generates a host of environmental, financial, and social benefits. Materials like glass, metal, plastics, paper, and organic materials (food and green yard waste) are collected, separated, and sent to facilities that can process these recyclables into new materials or products. Keep It Clean is a social enterprise aiming at providing easy solutions for individuals to take better care of the environment. They focus their solutions on waste management and recycling. 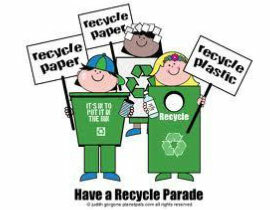 The aim of this yearly event is to help in saving the environment and teaching our children how to be eco-friendly. The plan is to eliminate litter and lead to zero residential waste-to-landfill. Then bring to Le Petit Poucet the above items in clean and neat condition and we will in turn pass it to Keep It Clean. For more information, please contact your child’s teacher.